[See update below] Works great! Give it a few weeks to do its thing and then sit back and enjoy and algae free pool. I was skeptical but am now a believer. Too good to be true is not the case (for me). A little on the pricey side, but the benefits outway the cost in my opinion. Using solar power (no batteries) this pool ionizer releases minute amounts of copper into the pool water creating an environment where algae cannot live or grow. Safe for swimmers and pool equipment if you monitor the copper levels. I am very happy with this purchase. Read full review below. UPDATE 4/13/2018: I decided not to use the Ionizer for awhile. I’m also dropping it from 4 stars to 3 stars. I think it is discoloring the floor of my pool. I know I have blue staining in the small alcove area (previously the spa area – opened up to pool by removing a wall a few years ago). I’m torn right now. The Remington Solar Pool Ionizer does work. I had no algae last year. I removed the ionizer over the winter and am now battling algae once again. I switched to liquid chlorine based on posts on the evils of the CYA (Cyanic Acid) tablets put into the pool. My CYA level was pretty high. You do need a small amount of CYA to block the suns UV from destroying the chlorine. But too much can cause other issues including damage to your plaster (gunite). Liquid chlorine is expensive. I’m now using close to two gallons a week ($6.50/week). If I can not get the algae under control, I may start using the Pool Ionizer again and keep an eye on the bottom of the pool. Last year was so nice, crystal clear water, no algae, much easier maintenance. That is why I’m giving it 3 stars. It works. But I deduct 2 stars because it “may” discolor the bottom of your pool. Let me know if you are using the Ionizer and if you have had any discolorations problems. UPDATE 7/24/17: Still no algae. I’ve been lax in not brushing down the sides or vacuuming the pool weekly. I brush every two weeks or so. The pool is not really used. I get in now and then to cool off. I have the pump go on two times a day for about 2 hours each time. Pool water is clear and still no signs of algae. I have noticed that in the shallow end, we have a small alcove – previously was a jacuzzi area. When we redid the pool, we cut the joining wall to the pool down into a seat in the water. That area does not get much circulation. Used to be worst area for algae. No algae now, but the bottom is getting discolored with blue splotches (marbling) and it appears that some blue tinted water is seeping out of two inflow pipes. The blue marbling on the bottom is probably the result of concentrated copper. However, I use the test strips and they still show less than .5 copper. I will keep you posted. Other than that, I am very happy with the Ionizer. I still need to put one of the new copper cores that I got from Costco into the device. Keeping it at 4 stars due to the jacuzzi area floor discoloration. UPDATE 6/21/17: Pool is crystal blue, no algae. I may up rating back to 5 stars. Once I got my pool chemicals in line – 1.4 chlorine, 7.4 Ph, 120 total alkalinity, and brushed the sides every 2 weeks, and run pump 4.5 hrs/day, I haven’t had any algae. 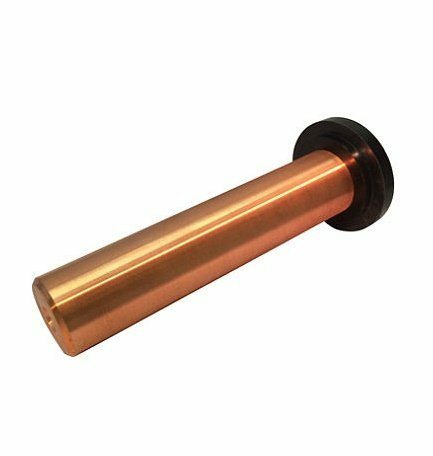 I just ordered 2 new copper cores from Costco ($60 ship free). I still have copper left on the original, but will probably replace it anyway to start a fresh season. Crossing fingers all stays algae-free. If no problems, I will rate 5-stars. I may cut chlorine to 1.0 to see what happens. UPDATE 5/22/2017: I dropped one star from the review rating (from 5 stars to 4 stars). Coming off of Winter into a warmer Spring I have noticed small amounts algae in the pool. I found I let my chlorine level drop to zero. I cleaned my diatomaceous earth filter, brought my pool chemicals into line, cleaned, brushed, and vacuumed the pool. I cleaned the Ionizer. The copper core is about 1/2 the size it was when new. I gave the pool a couple weeks to adjust. Without brushing, some algae started on my back wall (North facing) and in the alcove area where water does not circulate well. So far the algae is minimal and with a quick brushing, it goes away. I’m still happy with the Remington Pool Ionizer but not the “Wow!” factor I had when I first started using it at the end of the summer last year. I will replace the copper core soon and keep chemicals up to date and report back in a few weeks. For now, I still like it and think it helps, just not 100% like I thought last year. I just purchased this device from Costco for $99. It claimed to produce minute amounts of copper into the pool water creating an environment where algae cannot grow. I was very skeptical but am a big Costco fan and knew if it didn’t work it would be an easy return. The device looks fairly simple. It is a floater, like a chlorine dispenser. On the bottom side you screw in the provided copper core which is in the center of a wire coil that is affixed to the device. Then you attach a mesh cage over the coil and copper core to catch any droppings from the copper generated. This is to protect your pool bottom from getting discolored. The whole assembly takes only a couple minutes. Then just drop in your pool and wait. I documented my results in the video below. I was a little disappointed. No real change. Wanting this thing to work, I thought my weekly algae growth was not as bad as usual. To be fair, the nights are getting cooler and the water temperature is lower. Also, the manual said it takes 3-4 weeks for results – for enough copper to get into the water, depending on the size of your pool. My pool is about 17,000 gallons. One Solar Chlorine-Free Sun Shock Pool Ionizer is good for up to 22,000 gallons. If your pool is larger, you will need two devices. I could tell there was less algae than usual but still not a satisfying reduction. At least not enough to justify the cost. My pool back wall is North facing so is most prone to algae growth. Now I’m getting excited. It looks like this thing is really working. No signs of new algae. My chlorine levels are on the low side (2 parts using Taylor’s K-2006 Test Kit). Supposedly you can get by with .5 – 1.5 parts chlorine instead of the normal 3-4 parts. Will this miracle last….? Ecstatic! No algae. I have not cleaned the pool in 2 weeks and there is absolutely No Algae! I’m now a believer. I’m giving the Remington Solar Chlorine-Free Sun Shock Pool Ionizer and Purifier 5 stars. I will continue to monitor and update this review and reduce my rating if things change for the worse. The kit includes the solar ionizer device, one copper anode, one mesh cage with a plastic wingnut, a wire brush, and 30 copper test strips. Click on the image below to go to Amazon to read more specs and other reviews. Cost. The Chemical-Free Sun Shock device is not cheap. $99 at Costco is a good price. Amazon is around $135 Prime free shipping as of this review. Home Depot is about $130. Remington Solar claims you will save money by only needing to use 1/2 the amount of chlorine as usual. Plus no more need to shock your pool or use algaecide or the expensive PhosFree. The Copper Core. The copper core that you screwed into the bottom costs about $40 to replace. It is estimated you will need to replace every year. As it releases minute amounts of copper into your pool, it also will decrease in diameter size. If I can eliminate algae, $40 a year is fine with me. Home Depot has the copper anode for about $40. Amazon (as I’m writing this) is $52 free shipping. The kit includes one copper anode. Cleaning. This is not a set it and forget it device to eliminate algae in your pool. You need to clean the coil and core with a wire brush (included) every week or two. It is a little messy but not a difficult task. See my short video below. Floater blocking skimmer. Like any floater, while your pump is on, it will eventually end up at your skimmer and block it from doing its job. You can tether the pool ionizer so it does not reach your skimmer. I’ve been running my pump in 1 to 1 1/2 hour increments 3 times a day. Seems to be working well for me. My electric bill is lower and pool seems no worse for wear… especially with this new algae eliminator. So if the pool ionizer reaches the skimmer, it is only for a short time. Lack of sun. I doubt this is much of an issue for most. I live in southern California so I get a lot of sun. But the Remington Solar Chlorine Free Sun Shock Ionizer and Purifier is powered by the sun. Even on cloudy days, the solar panel on the top of the floater will still charge the system. Copper levels. Small amounts of copper in the water are fine for both the pool, equipment, and swimmers. But too much copper in the water is not recommended. The kit comes with 30 copper test strips. You dip the strip into your water and compare it to the color on the container to visually figure out your copper level. You should try to keep the copper level in your pool to .5 . If it starts to go higher, remove the device for a few days or week until the level drops. This is one extra thing you will have to do and there will be a small expense when you need to buy more test strips. I saw a 25 strip pack on Amazon for $9.95. Pool chemistry. You still have to check your pool Chlorine, pH, Alkalinity, Calcium Hardness and Cyanuric Acid, and maintain proper levels. This is not a con of the device, but you need to be aware this is not a set it and forget it fix. I highly recommend Taylor Technologies K-2006 Test Kit for professional water testing results. I’ve been using my kit for several years and buy refill replacement solutions as needed. Remember, instead of 3-4 parts Chlorine, you should be able to lower it to .5 – 1.5 parts. A certain level is helpful to kill bacteria. Although Remington Solar claims their ionizer also purifies and kills bacteria. I highly recommend the Remington Solar Chlorine-Free Sun Shock Pool Ionizer and Purifier. It is working for me. Your mileage may vary. I hate fighting algae, I hate having to clean the pool every week (I know, I could hire someone – but I’m too cheap to do that). I don’t mind monitoring my pool chemistry. The Taylor Test Kit makes checking pool chemistry easy and reliable. If I save money on Chlorine and Shock, all the better. It is so nice to look out my back window and see a pool with sparkling clear water and no yellow algae on the walls. 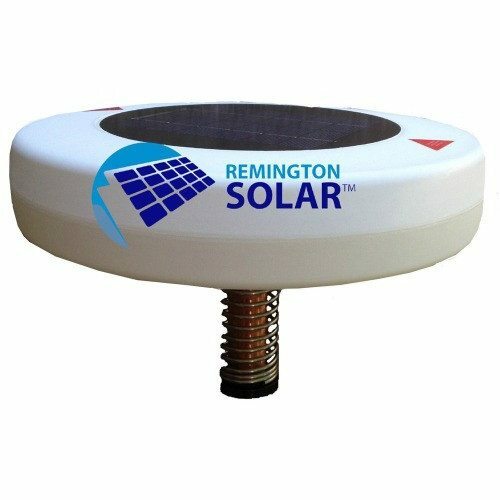 If you want to stop algae from growing in your pool, stop spending a fortune on shock and chlorine and algaecides, give the Remington Solar Chemical-Free Sun Shock device a try. If you’ve tried it or have a question, please comment below. I just put one in my pool last week. Came very close to dumping the water because I had a major problem with Algae and the pool supply said to dump the water and wanted to sell me chemicals and more chemicals. I must have spent $ 300 plus on chemicals and still the algae problem continued until they tested the water again and said the water was dead. Said the TDS was high. I did not want to dump the water and started asking around and searching the web. I was fed up with pool supply people especially Leslie’s because their people know Zero and all they want to do is sell chemicals. That’s what their trained to do. Then a friend told me about his neighbor who put the solar shock in. I went on line and to you tube. So I tried it. Put it in last Friday, It’s Sunday today and I am not seeing algae growing as before. I still have some mustard on the side walls and I am brushing it. I contacted Remington and they told me give it a few weeks and shock the pool. I did. So far its good. I cant say I am Ecstatic! yet Bob. I am not excited yet either. it’s not 2 weeks yet but I am hoping I get excited in 3 weeks and follow that with ecstatic. The one thing I need to look at is the pool size. I tried figuring my size and came up with 22,900 gallons according to the on line formulas to figure size. I mapped out the pool with measurements and sent those to Remington and they never confirmed if I was correct or close. I have an old pool. Built by Blue Haven. not around anymore. I suspect it was built in the mid 60’s or 70’s. It is a large pool not rectangle so its a bit tricky. I also have a diving board so that makes it probably deeper and needs to be calculated into the measurements and formula. So Remington never confirmed my size but emailed me back and said I was right at the edge and give it a few weeks and see how the solar shock works. I may need 2. So I will give it a few weeks more. Regarding the unit floating to the skimmer. I have that problem as well so I will use a cotton line to keep it from the skimmer. I do have 3 inlets on one end and diverter on each return. I direct the center one down to move water and the sides on an angle which gives a ripping effect. I did that so the water is constantly moving. That probably contributes to the solar shock moving towards the skimmer. I was always told it is better to have the water moving than still. I was reading up on the unit and on line again today and the one thing I found on the Q & A on Remington website is you can put a couple of tablets in the floater but no liquid. I understood that but they also said do not add Cyanuric Acid to the pool. well I am not doing that but I looked on the tablet bucket and it says Trichcoroisocyanuric Acid. So now I am confused. I checked other tablet manufactures and they all have the Cyanuric Acid. So it’s a bit confusing. They say no Cyanuric Acid and yet you can add a couple of tablets to the float and they have Cyanuric Acid. The one I mentioned above, Trichcoroisocyanuric Acid. those are Leslie’s brand. I have a 1/2 a bucket left. Purchased that a while ago. So if you have or come across any answers to this cyanuric acid in tablets please let me know. I put 2 in the pool today. Instructions say, 1 per 10,000 gallons. The friend who told me about it, well his neighbor uses a couple of tablets as well. He has his solar shock 1 year now and no algae. Any feedback will be most helpful. I think tomorrow I will call Remington and ask them about this as well. It’s Sunday and they are closed. $ 109.00 plus tax and free shipping from Sam’s club on line. They are competing with Amazon now. Sam’s wins this battle because I buy alot from Amazon but I did not see a 109 price with 2 anodes. So Sam’s wins because with tax I paid 120.35 and shipped free PLUS, this one from Sam’s club comes with 2 Anodes. So that’s another 40.00 plus tax I saved. So Sam’s Club at 120 with 2 anodes is saving me 40 plus tax plus another 20 – 30 from other sellers and shipping. I figure I am saving 80 – 100 dollars because this one came with 2 copper anodes. Not bad. I cleaned it after 1 week in today. They say every 2 weeks but I am glad I did it today. Had alot of gunk on it. so i know its working. The only negative about this product is the basket. They should give you a back up. with the cleaning of the basket I don’t see it lasting long. I used the wire brush very little and then an old toothbrush because I can see the screen ripping easily down the road. Well, thanks for reading my reply and thank you for your experience with the product. I’ll let you know when I am excited, LOL week 3 hopefully and week 4 hopefully Ecstatic. I will really be Ecstatic if I don’t need to buy a second one. We shall see. Is a copper ionization system (no chlorine) and I can not get the pool clear to save my life… if you have switched to a copper system entirely, then clearly it’s me, not the copper system! Jen, I have the standard chlorine pool. I have stopped using the Ionizer. The first year it seemed to work and eliminated algae but I started noticing spotting on the pool floor and some streaking on the walls. I believe as a result of copper leakage from the ionizer. This year I tried chlorinating my pool just with liquid chlorine per a suggestion from a post on my YouTube video. Bad mistake. It was very expensive, my PH was always high, lots of muriatic acid needed, and I had the worst algae in years. I switched back to 3″ tablets, did a total algae cleaning regiment, lots of shock, and now have crystal clear pool – no algae. I tried using the Pool Ionizer again, but I don’t think it is working any longer. After a couple weeks there was no build-up on the coil so I stopped using it. I realize your situation is different. I don’t know anything about your system so cannot offer any advice or tips. Good luck.